Welcome to Knife Den! You are at the web’s number one resource for all things knives. We feature reviews, tutorials, and more. If you’re looking for information about anything to do with knives, you are in the right place. Below you’ll find links to our most popular articles and reviews. If you would like information about a topic that you don’t see covered on our site, shoot us an email and let us know! Our specialty is covering pocket knives. We have tons of information about specific knives, maintenance, and more! It covers anything and everything you’ll ever want to know about pocket knives! Without a doubt one of the most iconic pocket knives of all time, the Buck 110 is a classic knife that still performs exceptionally well to this day. It’s legendary performance and timeless style make it without a doubt one of the top choices you should consider. It is especially popular with hunters and outdoorsman and usually features a wooden styled handle. You can buy one on Amazon, or read our full review here. 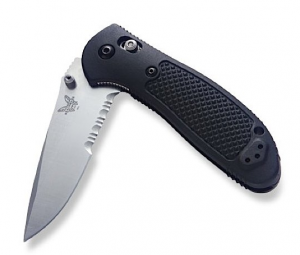 A more modern knife, the Benchmade Griptilian has quickly built a name for itself with its simple design and rugged practicality. It is useful for a myriad of tasks, with the ability to handle virtually any task you throw at it. Simple, strong, and useful. You can buy one on Amazon or of course read our full review before you make a decision. The slim and sleek Kershaw Leek is a totally different style than the knives above, but it is definitely a knife worth considering. It is one of the most modern looking and easy to carry knives we’ve ever seen. It’s slim profile make it easy to carry around either in a pocket or clipped onto your waistline. You can buy one on Amazon now or read our full review here. If you are looking for a more radical, unconventionally styled pocket knife, you should look into the Spyderco Tenacious. This odd looking knife features a unique hole in the top of blade, making it easy to open the knife quickly and without hassle. This unique knife can also be purchased on Amazon, and you can read our full review of it here. For the tactical crowd, the SOG Flash II offers a unique profile and features that make it advantageous for any tactical situation. If your knife is going to be used for anything more serious than whittling and cutting apples, you may want to consider this well constructed tactical blade made by SOG. View the selection on Amazon or read our full review here. You’ll see this knife plastered around the site, and for good reason. The Blur is one of the best knives I’ve ever seen. It is high quality and designed insanely practically, without a lot of frills. It’ll get the job done every time, and it’ll do it right. And, it isn’t as outrageous as many modern pocket knives are. View the Blur on Amazon or read our full review here.